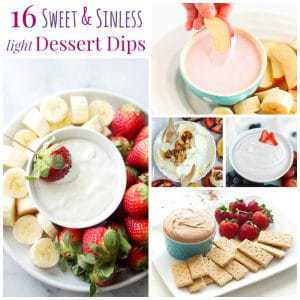 You only need six ingredients for this healthy dip recipe that's a light sweet treat. 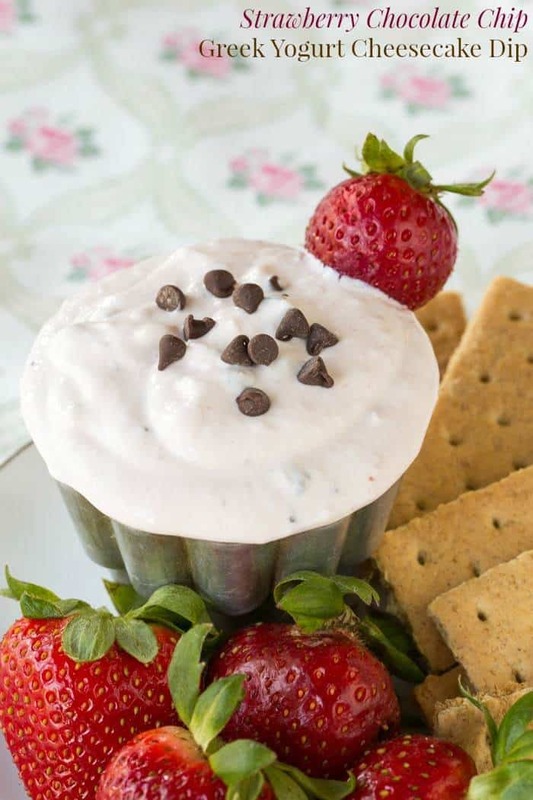 Strawberry Chocolate Chip Greek Yogurt Cheesecake Dip is a sweet but healthy after school snack dip or easy gluten-free dessert dip recipe. 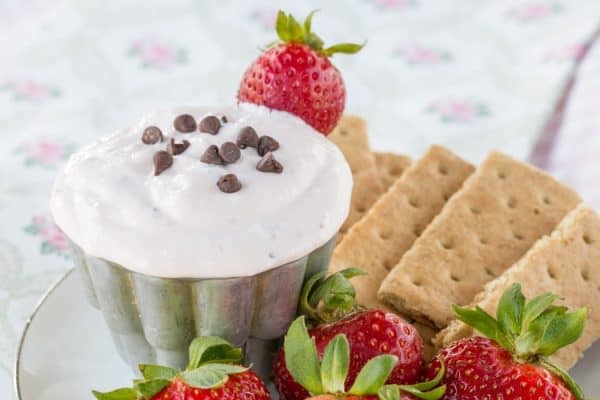 Get your graham crackers and fruit ready to dunk into this easy six-ingredient Strawberry Chocolate Chip Greek Yogurt Cheesecake Dip. I know that there’s going to come a day when I will be yelling and screaming to try to drag my two sleepyhead teenagers out of bed so they can make it to school on time. But until that day comes, can’t I just sleep in once a week? And when I say “sleep in”, all I am asking for is, like 7am, maybe the occasional 8 or 8:30 once every couple of months. Nope. On Saturday, they were up at 6, wreaking havoc in their bedroom. Later that morning we were off to a birthday party where they both ran, jumped, and played in a bunch of inflatables for an hour and a half. The Bug then had a baseball game while I took Little Dude to nap. He fought the nap, then finally crashed when shortly thereafter The Bug bursts through the door at top volume after his game. So what do you do with two tired, whiny kids when it’s only 3 in the afternoon? Run them into the ground, obviously. So we walked to the park, they ran around like little nuts, walked home, and then rode their bikes. An extra long bubble bath, some dinner, and these kids crashed. We totally thought we might actually have a chance of sleeping in a bit on Sunday. Welllllll, in their Saturday morning antics, Little Dude thought it would be fun to mess around with the clock in their room, and at 6:30 am on Sunday morning the alarm starts blaring. But it’s healthy cheesecake in dessert dip form, so it’s all good. 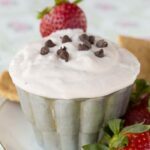 Strawberry Chocolate Chip Greek Yogurt Cheesecake Dip is a super simple sweet treat the kids will love. And you’ll love knowing that it’s packed full of good-for-you ingredients. Of course, there’s some cream cheese in there, because it needs that cheesecake-iness. But I actually found a Greek yogurt by Green Mountain Farms that has a ton more protein, so I thought that was a super-cool grocery store find. 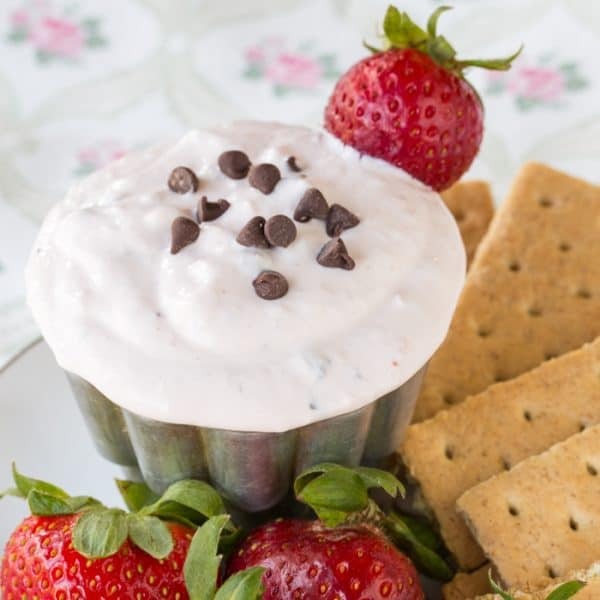 With all of the bright, juicy berries in the markets and stores, you have to whip up this yummy Strawberry Chocolate Chip Greek Yogurt Cheesecake Dip! When did your kids start sleeping in? In a blender, puree strawberries. Add cream cheese, Greek yogurt, vanilla, and honey, or other sweetener, and puree until smooth. Or combine ingredients in a bowl and mix with a hand mixer or whisk until smooth. Stir in the chocolate chips, reserving a few to sprinkle on top if desired. 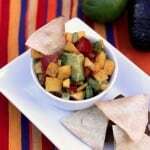 Serve with fruit and graham crackers for dipping. 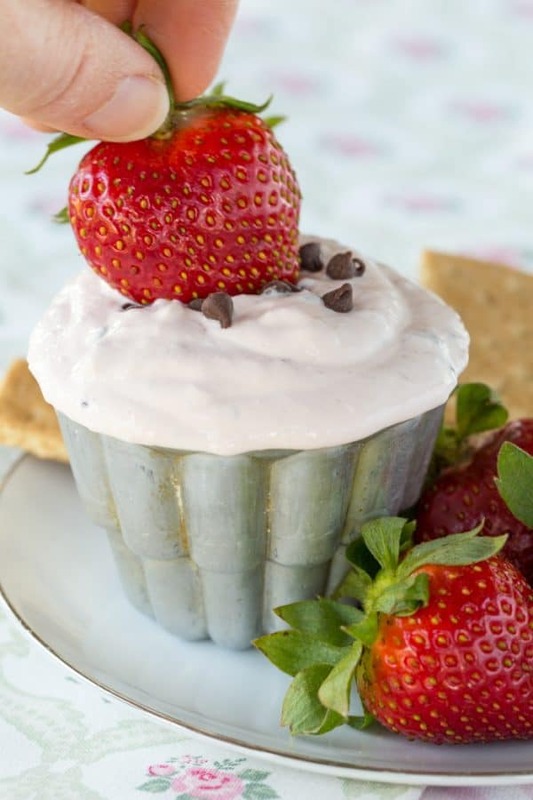 Enjoy this Strawberry Chocolate Chip Greek Yogurt Cheesecake Dip! 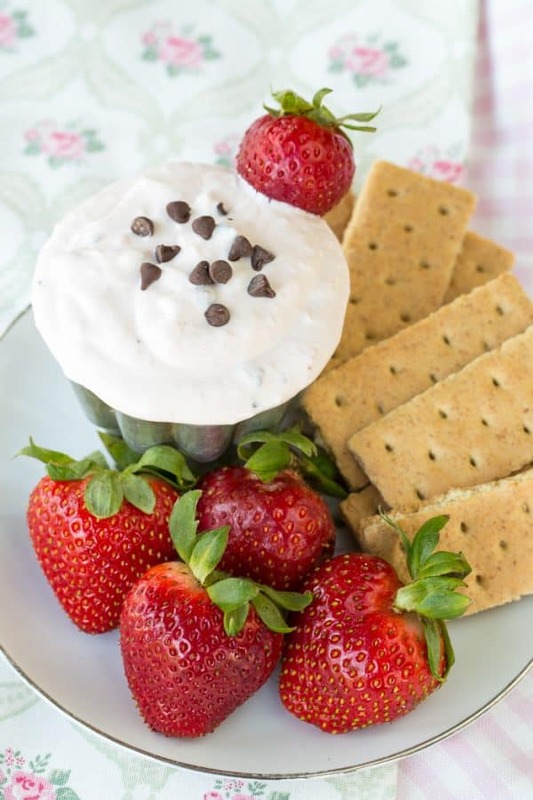 Low Fat Chocolate Chip Peanut Butter Dip, from It’s Yummi. Peanut Butter Honey Yogurt Dip, from Two Peas and Their Pod. 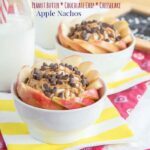 Ice Cream Apple Dip, from Crazy for Crust. Thanks so much for joining us at Delicious Dishes! 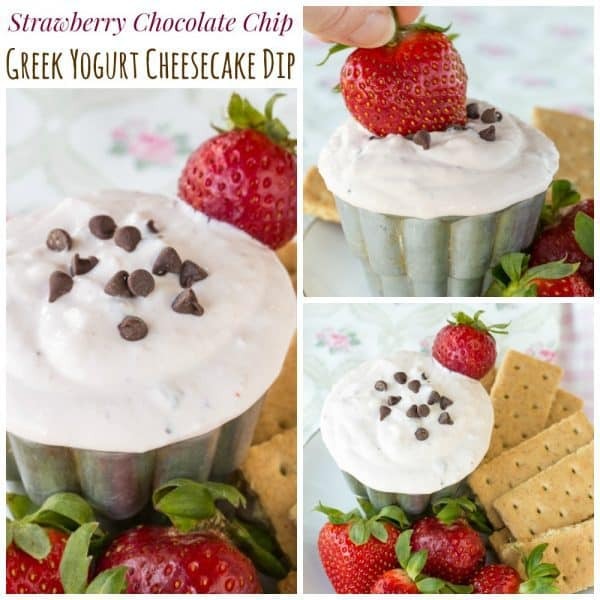 We love your Strawberry Chocolate Chip Greek Yogurt Cheesecake Dip recipe and hope you’ll join us again this week! 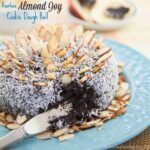 Looks yum. Thank you for sharing with us at #HomeMattersParty. We would love to have you again next week. Thank you for sharing it at Thoughts of Home. This sounds delicious, nutritious and low cal. I like that!! oh and i LOVE this dip! !